Perry R. Sanders was born in 1928 in Allendale, South Carolina and began preaching at the age of 16. At age 11 he learned to speak Latin and the following year his mother taught him how to speak French. In 1943 he moved to South Louisiana. He married Gloria Hilda McMorris in 1953. After her death in 1983 he married Kae Hollifield Chism in 1984. He received his B.A. degree from B.J.C., in Cleveland, Tennessee; Th.M. : New Orleans Baptist Theological Seminary; D.D. : Louisiana College, Pineville, Louisiana; D.D. : United Theological Seminary. In 1902, The Louisiana Board of Missions organized the First Baptist Church. It was well before Perry’s time in 1910, that the church’s first 3,200 square foot building on the corner of Jefferson and Lee was founded giving the “little French Mission” a permanent home. Before arriving in Lafayette, Sanders was pastor at First Baptist Churches in Hillsboro, Alabama; Springfield, Louisiana; Ponchatoula, Baton Rouge, and Jennings, Louisiana. In 1959, Rev. Perry Sanders arrived in Lafayette to 1209 members of the largest non-catholic church in the city of Lafayette.. In 1959, the value of the church property was estimated at nearly a half million dollars. Today, First Baptist church is valued at over 25 million dollars. Through it all, Sanders has been an icon in South Louisiana religious circles since. It was in 1963 that regular telecasts raised the visibility of the church and strengthened the positive image of the church in the Lafayette community. The ability to have “Brother Perry” in the living rooms of Acadiana made people feel they were on a first name basis with him. Today the church boasts membership of over 4,700 members. Built in 1948, the sanctuary of the First Baptist Church quickly became a landmark in downtown Lafayette. For just over 50 years it’s steeple had been one of the tallest points in the southwest side of the Central Business District. In a tragic fire in 1999, the First Baptist Church was virtually destroyed. One week later, church members were greeted by a rainbow above the church gym that would serve as an interim worship center for nearly five years, This rainbow inspired Sanders to implement the “Promise” campaign that would provide funds for building a new sanctuary. On April 9, 2000 just ten months after the fire, over 1,600 members gathered under a huge tent on the proposed new building site and pledged over $8 million allowing Sanders to construct a new 11,000 square foot church at a cost of over $15 million. Rev. Sanders had the foresight to plan a church facility that will undoubtedly meet the needs of the church for many years to come. Inside the new sanctuary, Rev Perry Sanders preached from the same pulpit that had been a fixture in the sanctuary for half a century. Still charred from the fire, it today reminds the congregation of the church’s rich heritage and vision for future growth of the ministry in Acadiana. It also reminds all those who attend that “Brother Perry” had himself been an inspiration. He educated thousands of Cajuns to understand that a devotion to religion is still sacred and admired. He was a man of courage who has led an exemplary life, fighting moral issues in the Acadiana area that threaten the principals of decency. His high intellectual and moral values has helped transform Acadiana into an area of the country that considers faith and family to be the most important of all assets. 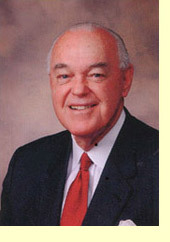 At 2 a.m. on Monday, March 26, 2012, after serving as First Baptist Church for 47 years before retiring in 2006, Rev. Sanders passed away at age 84 in Colorado Springs, Colorado. Friends and churchgoers remember Perry Sanders as a preacher who was unafraid of taking on social issues, who preached the gospel wherever he went, and who loved life and Lafayette.